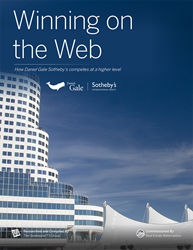 The “Winning on the Web” case study, researched and analyzed by the Swanepoel T3 Group, reveals that by working with Real Estate Webmasters, Daniel Gale Sotheby’s International Realty was able to generate impressive results in just six months. When a brokerage wants to improve its online presence, it’s usually more work than is expected. With a combination of advanced technologies and heavy lifting by the broker, great results can be achieved. The Swanepoel T3 Group has released a case study that reveals how Daniel Gale Sotheby’s International Realty leveraged Real Estate Webmasters to generate a 293 percent increase in new visitor traffic to its website. Daniel Gale Sotheby’s International Realty, a Long Island real estate brokerage with $3.1 billion in annual sales volume, faced challenges with its website, which included an outdated design and poor mobile responsiveness, search engine optimization and bounce rates. The “Winning on the Web” case study reveals that by working with Real Estate Webmasters, the company was able to generate impressive results in just six months. This includes a 260 percent increase in unique visitors, a 611 percent increase in page views, and a 500 percent increase in daily registrations. The Swanepoel T3 Group reviewed the key features of Real Estate Webmasters, providing an objective analysis of its strengths, opportunities for improvement, and recommendations for brokerages interested in working with a website technology vendor. The report can be downloaded at http://www.t3sixty.com/REWcasestudy. Honored by Profit 500 as one of Canada's fastest growing companies, Real Estate Webmasters offers end-to-end solutions for real estate professionals, from Websites, CRM to consulting and marketing (SEO and PPC). Recognized as the leading provider of custom website development, marketing and software applications the company understands itself as a key technology partner to their clients and takes huge pride in serving many real estate industry leaders across the United States and Canada. Founded in 1922, Daniel Gale Sotheby’s International Realty consistently leads the nation in achieving one of the highest average sales prices in the country. DGSIR is a $3.1 billion dollar plus organization with over 900 sales associates in 28 sales offices spanning Long Island. Services include a Relocation Division, an award-winning Marketing & Technology Department, a Development Marketing Group, Commercial and Rental Divisions; Ambassador Abstract title company, and a Wells Fargo Home Mortgage affiliation. The Sotheby’s International Realty® affiliate for Long Island’s North Shore since 1976, DGSIR has gained national and international recognition, including top honors worldwide. The Swanepoel T3 Group provides CEOs, business leaders, association and MLS executives, brokers and high-performance teams the knowledge, best practices and support to reshape their business. T3 Sixty, the consulting arm of the Swanepoel T3 Group, provides a 360-degree approach to real estate businesses with extensive research, trend and strategic analysis. It provides an authoritative perspective on business innovation, digital disruption management and supports firms with risk and compliance assessments and preparation.